A beautiful little plaque erected in the memory of just two men by the inhabitants of a tiny parish , commemorating the fact that they had been volunteers. Private William Smale of the 4th Battalion, the Devon Company of Volunteers (the 4th Battalion, the Devonshire Regiment). Son of Thomas and Charlotte Smale . Born in Beaworthy in 1879. Died of dysentery 29 March 1900 aged 22. 5585 Private George Piper of the 4th Battalion, the Devon Company of Volunteers (the 4th Battalion, the Devonshire Regiment). Son of John and Agnes Piper. Born in Monkokehampton in the March Quarter of 1879. Died of dysentery 8 April 1900 aged 22. 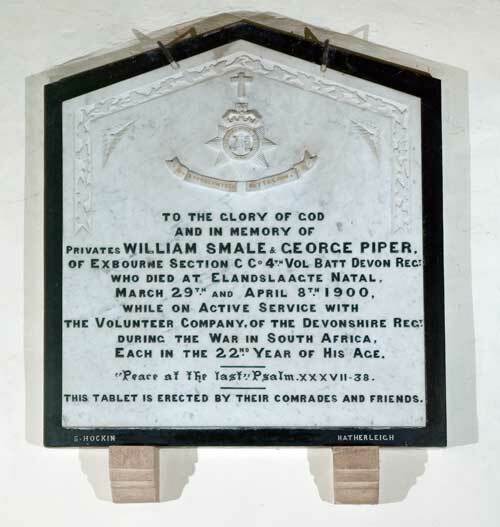 A few days previously he had acted as pallbearer at the funeral of his friend William Smale who died 29 March 1900.